1920 25 April - Iraq is placed under British mandate. 1921 23 August - Faysal, son of Hussein Bin Ali, the Sharif of Mecca, is crowned Iraq's first king. 1932 3 October - Iraq becomes an independent state. 1958 14 July - The monarchy is overthrown in a military coup led by Brig Abd-al-Karim Qasim and Col Abd-al-Salam Muhammad Arif. Iraq is declared a republic and Qasim becomes prime minister. 1963 8 February - Qasim is ousted in a coup led by the Arab Socialist Baath Party (ASBP). Arif becomes president. 1963 18 November - The Baathist government is overthrown by Arif and a group of officers. 1966 17 April - After Arif is killed in a helicopter crash on 13 April, his elder brother, Maj-Gen Abd-al-Rahman Muhammad Arif, succeeds him as president. 1968 17 July - A Baathist led-coup ousts Arif and Gen Ahmad Hasan al-Bakr becomes president. 1970 11 March - The Revolution Command Council (RCC) and Mullah Mustafa Barzani, leader of the Kurdistan Democratic Party (KDP), sign a peace agreement. 1972 - A 15-year Treaty of Friendship and Cooperation is signed between Iraq and the Soviet Union. 1972 - Iraq nationalises the Iraq Petroleum Company (IPC). 1974 - In implementation of the 1970 agreement, Iraq grants limited autonomy to the Kurds but the KDP rejects it. 1975 March - At a meeting of the Organisation of Petroleum Exporting Countries (Opec) in Algiers, Iraq and Iran sign a treaty ending their border disputes. 1979 16 July - President Al-Bakr resigns and is succeeded by Vice-President Saddam Hussein. 1980 1 April - The pro-Iranian Dawah Party claims responsibility for an attack on Deputy Prime Minister, Tariq Aziz, at Mustansiriyah University, Baghdad. 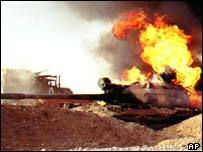 1980 4 September - Iran shells Iraqi border towns (Iraq considers this as the start of the Iran/Iraq war). 1980 17 September - Iraq abrogates the 1975 treaty with Iran. 1980 22 September - Iraq attacks Iranian air bases. 1980 23 September - Iran bombs Iraqi military and economic targets. 1981 7 June - Israel attacks an Iraqi nuclear research centre at Tuwaythah near Baghdad. 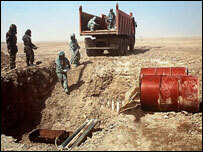 1988 16 March - Iraq is said to have used chemical weapons against the Kurdish town of Halabjah. 1988 20 August - A ceasefire comes into effect to be monitored by the UN Iran-Iraq Military Observer Group (Uniimog). 1990 15 March - Farzad Bazoft, an Iranian-born journalist with London's Observer newspaper, accused of spying on a military installation, is hanged in Baghdad. 1990 2 August - Iraq invades Kuwait and is condemned by United Nations Security Council (UNSC) Resolution 660 which calls for full withdrawal. 1990 6 August - UNSC Resolution 661 imposes economic sanctions on Iraq. 1990 8 August - Iraq announces the merger of Iraq and Kuwait. 1990 29 November - UNSC Resolution 678 authorizes the states cooperating with Kuwait to use "all necessary means" to uphold UNSC Resolution 660. 1991 16 -17 January - The Gulf War starts when the coalition forces begin aerial bombing of Iraq ("Operation Desert Storm"). 1991 13 February - US planes destroy an air raid shelter at Amiriyah in Baghdad, killing more than 300 people. 1991 24 February - The start of a ground operation which results in the liberation of Kuwait on 27 February. 1991 3 March - Iraq accepts the terms of a ceasefire. 1991 Mid-March/early April - Iraqi forces suppress rebellions in the south and the north of the country. 1991 8 April - A plan to establish a UN safe-haven in northern Iraq to protect the Kurds is approved at a European Union meeting. On 10 April the USA orders Iraq to end all military activity in this area. 1992 26 August - A no-fly zone, which Iraqi planes are not allowed to enter, is set up in southern Iraq, south of latitude 32 degrees north. 1993 27 June - US forces launch a cruise missile attack on Iraqi intelligence headquarters in Baghdad in retaliation for the attempted assassination of US President George Bush in Kuwait in April. 1994 29 May - Saddam Hussein becomes prime minister. 1994 10 November - Iraqi National Assembly recognises Kuwait's borders and its independence. 1995 14 April - UNSC Resolution 986 allows the partial resumption of Iraq's oil exports to buy food and medicine ( the "oil-for-food programme"). It is not accepted by Iraq until May 1996 and is not implemented until December 1996. 1995 August - Saddam Hussein's son-in-law, Gen Hussein Kamil Hasan al-Majid, his brother and their families leave Iraq and are granted asylum in Jordan. 1995 15 October - Saddam Hussein wins a referendum allowing him to remain president for another seven years. 1996 20 February - Hussein Kamil Hasan al-Majid and his brother, promised a pardon by Saddam Hussein, return to Baghdad and are killed on 23 February. 1996 31 August - After call for aid from KDP, Iraqi forces launch offensive into northern no-fly zone and capture Irbil. 1996 3 September - US extends northern limit of southern no-fly zone to latitude 33 degrees north, just south of Baghdad. 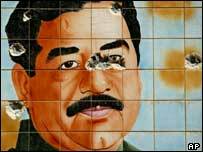 1996 12 December - Saddam Hussein's elder son, Uday, is seriously wounded in an assassination attempt in Baghdad. 1998 16-19 December - After UN staff are evacuated from Baghdad, the US and UK launch a bombing campaign, "Operation Desert Fox", to destroy Iraq's nuclear, chemical and biological weapons programmes. 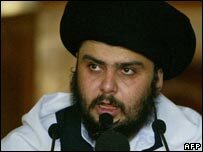 1999 19 February - Grand Ayatollah Sayyid Muhammad Sadiq al-Sadr, spiritual leader of the Shia community, is assassinated in Najaf. 1999 17 December - UNSC Resolution 1284 creates the UN Monitoring, Verification and Inspection Commission (Unmovic) to replace Unscom. Iraq rejects the resolution. 2001 February - Britain, US carry out bombing raids to try to disable Iraq's air defence network. The bombings have little international support. 2001 May - Saddam's son Qusay elected to the leadership of the ruling Baath Party, fuelling speculation that he's being groomed to succeed his father. 2002 April - Baghdad suspends oil exports to protest against Israeli incursions into Palestinian territories. Despite calls by Saddam Hussein, no other Arab countries follow suit. Exports resume after 30 days. 2002 September - US President George W Bush tells sceptical world leaders at a UN General Assembly session to confront the "grave and gathering danger" of Iraq - or stand aside as the US acts. In the same month British Prime Minister Tony Blair publishes a dossier on Iraq's military capability. 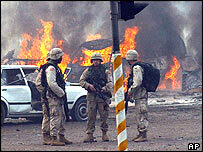 2003 20 March - American missiles hit targets in Baghdad, marking the start of a US-led campaign to topple Saddam Hussein. In the following days US and British ground troops enter Iraq from the south. 2003 9 April - US forces advance into central Baghdad. Saddam Hussein's grip on the city is broken. In the following days Kurdish fighters and US forces take control of the northern cities of Kirkuk and Mosul. There is looting in Baghdad and elsewhere. 2003 April - US lists 55 most-wanted members of former regime in the form of a deck of cards. Former deputy prime minister Tariq Aziz is taken into custody. 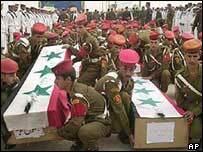 2003 August - Deadly bomb attacks on Jordanian embassy and UN HQ in Baghdad. Saddam's cousin Ali Hassan al-Majid, or Chemical Ali, captured. Car bomb in Najaf kills 125 including Shia leader Ayatollah Mohammed Baqr al-Hakim. 2004 February - More than 100 killed in Irbil in suicide attacks on offices of main Kurdish factions. Saddam Hussein transferred to Iraqi legal custody. 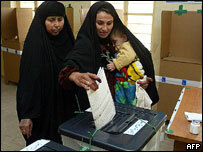 2005 30 January - An estimated eight million people vote in elections for a Transitional National Assembly. The Shia United Iraqi Alliance wins a majority of assembly seats. Kurdish parties come second. 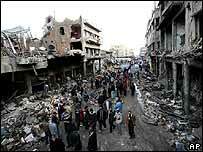 2005 28 February - At least 114 people are killed by a massive car bomb in Hilla, south of Baghdad. It is the worst single such incident since the US-led invasion. 2005 July - Study compiled by the non-governmental Iraq Body Count organisation estimates that nearly 25,000 Iraqi civilians have been killed since the 2003 US-led invasion. 2005 September - 182 people are killed in attacks in Baghdad, including a car bomb attack on a group of workers in a mainly-Shia district. 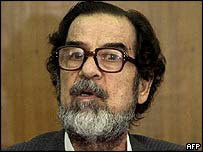 2005 October - Saddam Hussein goes on trial on charges of crimes against humanity. Voters approve a new constitution, which aims to create an Islamic federal democracy. 2005 15 December - Iraqis vote for the first, full-term government and parliament since the US-led invasion. 2006 20 January - Shia-led United Iraqi Alliance emerges as the winner of December's parliamentary elections, but fails to gain an absolute majority. 2006 22 April - Newly re-elected President Talabani asks Shia compromise candidate Jawad al-Maliki to form a new government. The move ends four months of political deadlock. 2006 September - A much-anticipated ceremony to transfer operational command from US-led forces to Iraq's new army is postponed. 2006 November - Saddam Hussein is found guilty of crimes against humanity and sentenced to death. Iraq and Syria restore diplomatic relations after nearly a quarter century. More than 200 die in car bombings in the mostly Shia area of Sadr City in Baghdad. An indefinite curfew is imposed after what is considered the worst attack on the capital since the US-led invasion of 2003. 2006 December - Iraq Study Group report making recommendations to President Bush on future policy in Iraq describes the situation as grave and deteriorating. It warns of the prospect of a slide towards chaos, triggering the collapse of the government and a humanitarian catastrophe. 2006 30 December - Saddam Hussein is executed by hanging. Barzan Ibrahim - Saddam Hussein's half-brother - and Awad Hamed al-Bandar, former head of the Revolutionary Court, are executed by hanging. Former Vice-President Taha Yassin Ramadan is executed on the fourth anniversary of the US-led invasion. 2007 12 April - A bomb blast rocks parliament, killing an MP. 18 April - Bombings in Baghdad kill nearly 200 people in the worst day of violence since a US-led security drive began in the capital in February. 2007 May - The leader of al-Qaeda in Iraq, Abu Ayyub al-Masri, is reported killed. 2007 July - President Bush says there's been only limited military and political progress in Iraq following his decision to reinforce US troops levels there. 2007 October - Turkish parliament gives go-ahead for military operations in Iraq in pursuit of Kurdish rebels. Turkey comes under international pressure to avoid an invasion. The number of violent civilian and military deaths continues to drop, as does the frequency of rocket attacks. 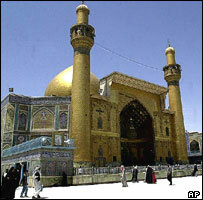 Karbala, the mainly Shia province, becomes the 18th province to be transferred to local control. 2008 February - Suicide bombings at pet markets in Baghdad kill more than 50 people in the deadliest attacks in the capital in months. 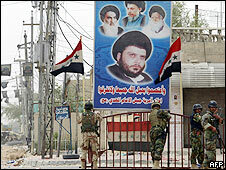 2008 April - Sadr threatens to scrap Mehdi Army truce which he declared in August 2007. US military commander in Iraq, General David Petraeus, tells Congress he plans to halt US troop withdrawals because of fragile security gains. 2008 June - Australia ends its combat operations in Iraq. Mr Maliki pays third visit to Iran since taking office as premier. He seeks to allay Iranian fears over proposed indefinite extension of US military presence in Iraq by saying he will not allow his country to be used as a launch pad for an American attack on Iran. 2008 July - Prime Minister Maliki for the first time raises the prospect of setting a timetable for the withdrawal of US troops as part of negotiations over a new security agreement with Washington. The main Sunni Arab bloc, the Iraqi Accordance Front, rejoins the Shia-led government almost a year after it pulled out. 2008 September - US forces hand over control of the western province of Anbar to the Iraqi government. Once a flashpoint of the anti-US insurgency and later an al-Qaeda stronghold, Anbar is the first Sunni province to be returned to Baghdad's Shia-led government. Iraqi parliament passes provincial elections law after long debates. Issue of contested city of Kirkuk set aside so that elections can go ahead elsewhere. 2008 October - Members of the Baghdad Awakening Council, estimated to number about 54,000, move to the Iraqi government payroll, with other members of the Sunni militia councils set to follow. The US military says al-Qaeda in Iraq's second-in-command has been killed during a raid in the northern city of Mosul, and that the group's top commander in east Baghdad has also been killed. The government sends extra police to Mosul to protect the city's Christians after a spate of killings blamed on al-Qaeda. 2008 November - The Iraqi parliament approves a security pact with the United States under which all US troops are due to leave the country by the end of 2011. 2009 January - Iraq takes control of security in Baghdad's fortified Green Zone and assumes more powers over foreign troops based in the country. Prime Minister Nouri Maliki welcomes the move as Iraq's "day of sovereignty". A suicide bomber kills and wounds dozens at a feast for Sunni Arab electoral candidates and tribal leaders in the town of Yusufiyah, near Baghdad. The new US embassy in Baghdad - one of the largest and most expensive ever built - is officially opened amid heavy security. Election day strangely tranquil, reports the BBC's Andrew North. So what exactly is wrong with the legs of Carla Bruni's ex?